The foreign-born workforce tends to grow at the slowest rate in places where there is already the greatest number of foreign-born workers. If a population is already large, then even substantial increases in the numbers will produce a small rate of growth. The previous sections focused on growth rates. This section focuses on states with already large immigrant populations that experienced large increases in the numbers of foreign-born workers. It explores whether the analysis under-emphasizes the role of the existing stock of foreign-born workers in affecting the employment rate of native-born workers. Consider a traditional immigrant settlement state such as California. In both 2000 and 2004, the employment rates for native-born workers in California were below average. This outcome could not be attributed to the rate of growth in the foreign-born population 16 and older because the rate in California was well below average from 1990 to 2000 and from 2000 to 2004. But in California, foreign-born workers make up more than 30% of the labor force, well above the average of 9.7%. Having such a large stock of foreign-born workers raises the possibility that their sheer numbers contributed to relatively worse outcomes for native-born workers. Does this hold true across all other areas? Figures 3 and 4 show the relationship between the share of foreign-born workers in the labor force and the employment rate for native-born workers in 2000 and 2004 respectively (also, see Tables A1 and A2 in Appendix A). Again, there is no meaningful relationship between the stock of foreign-born workers in a state and the employment outcomes for native-born workers. Indeed, the distribution of states across the four quadrants in Figures 3 and 4 resembles the spreads in Figures 1 and 2 and indicates that the share of foreign-born workers in a state is not associated with the employment rate for native-born workers. In addition to California, Florida and New York have among the highest shares of foreign-born workers in their labor forces. In 2004, the employment rate for native-born workers was 59.1% in both New York and Florida, well below the across-state average of 63.3%. 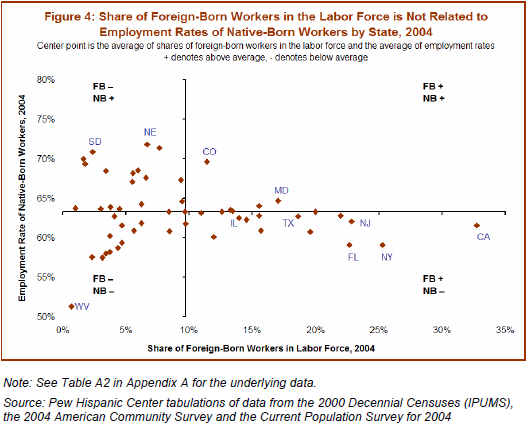 The two states appear in the lower-right quadrant in Figures 3 and 4, indicating that the low employment rates for native-born workers in these states may be related to high shares of foreign-born workers in the labor force. But each state also represents extenuating circumstances. The lower-than-average employment rates in Florida and New York are more likely a consequence of demographic and economic factors unrelated to the presence of foreign-born workers. Florida has a much higher-than-average share of residents 65 and older (21% of the working-age population compared with 16% for the country, according to American Community Survey data for 2004). This demographic reality naturally lowers the labor force participation rate and the employment rate in Florida. Economic growth in New York lagged behind the national average in both the expansion of the 1990s and the more unsettled economic period between 2000 and 2004. Annual growth in per capita personal income averaged 4.4% from 1990 to 2000 and 3.2% from 2000 to 2004 in all states and the District of Columbia. In comparison, the growth rate in New York was 4% from 1990 to 2000 and 2.4% from 2000 to 2004. Research also indicates that economic restructuring in New York was more severe than in the rest of the country (Groshen, Potter and Sela, 2004).